I remember that moment so many years ago. His name, yes, my precious baby boy’s name, announced for all to hear. Our tow headed blessing stepped forward and that grin, which captured the hearts of far too many four year old girl teammates, radiated across the field. The coach presented him with his very first trophy and our son clutched it tight. We drove home and that sparkling trophy claimed a place of honor right on his nightstand; for awhile. That spot soon became inundated with more pieces of metal. From soccer, basketball, baseball, then football, trophies began to pile up like scratch paper and safety pins in our junk drawer. They finally made their way to a cardboard box and were hauled to the attic during one of the “clean your room or else” days, never to be thought of again until years later when they ended up at Goodwill. He never knew they were gone. You see, these participation trophies weren’t given because of the character demonstrated on the field. It wasn’t because he showed up day in and day out in freezing cold weather and gave it his all or even because he choose to be a servant leader on the court. It wasn’t awarded because their team fought hard and won in the final inning. It was because someone, somewhere, who didn’t know anything about my child’s make up or work ethic or even his commitment level to the team, decided that every child needs to feel good about themselves, at all times, in all situations, whether they participated well or not, whether they had a team attitude or not, whether they even gave it their all. Someone determined that merely showing up somehow equaled success. That just being present, even if you have a bad attitude at every practice, is somehow presidential. Let’s save money on youth sports budgets and stop with the “Just Show up and we’ll give you a trophy” Mentality. Because honestly, this isn’t about the trophy. For years, we’ve accepted them, but it’s the entitlement mentality behind it that’s permeating all aspects of the next generation. Somewhere along the line, we aren’t expecting our kids to do the hard things; to develop character through sports. We rescue them for any difficulty and allow excuses at every turn. What happened to encouraging them to push through the fatigue even when they are set on giving up, to keep a good attitude even when getting creamed, to not blame every single issue on the ref or the coach you don’t like? Do we really want to encourage our kids with the message that mediocre is award worthy? Do we want to affirm the child that doesn’t commit fully to a team, skips practice for no good reason and has no desire to work as a team player? (Parents, we may need to think about this before signing our child up for a sport?) What does it tell the other hard working kids when the others walk off the stage at awards night with a participation trophy (or medal etc) and they’ve been told that their actions are award worthy? Now here is where I want to make myself clear, this is not about just giving awards to those who excel on the athletic field. I am not a win at all costs parent. I have been a varsity football parent for a team who lost every game and I could not have been more proud of my son than during that very difficult season. It stunk, but it changed him. It changed me. It’s during those kind of seasons where character is determined and unfortunately, I can’t say it fared very well for many others on that team, nor their parents. It was revealing. Having coached myself, I would rather honor the kid that may not score all season, but shows up every day, comes with a great attitude and has an excellent work ethic, rather than the child who gives 10% all year, but ends up being the MVP. That only lasts so long and eventually that does break down. 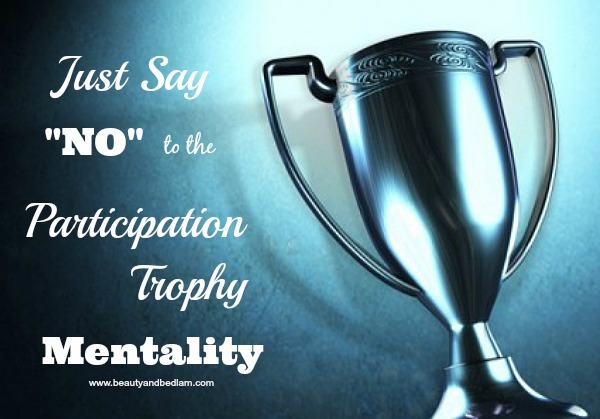 I’ve witnessed phenomenal athletes who had everything handed to them on a silver platter through high school, lose their full sports, college scholarship because the “participation trophy mentality” no longer cut it. One of the character awards we give out to our basketball teams is the Hustler Award. In my father’s opinion, (he played basketball at University of Wisconsin), he would rather receive the hustler award than MVP. While the MVP excels athletically, he/she may just have pure athletic ability without having a team player, work hard at all costs, mentality. The Hustler award shows determination, perseverance and the heart to go the extra mile. It’s typically not someone who has a lot of points, but they give 110% percent on the court and show character. If you’re involved in youth sports, I’m just sharing food for thought from years of experience. There is no “right” way, but I know that society is enabling a “participation mentality” without character that can’t be good for our children long term. We just closed out another sports season and had our end of the year banquet. None of our kids were recognized this year. Truthfully, that same momma’s heart that years ago yelled, “He deserved it,” wanted to hear their name be called now. Every parent wants their child to be “known,” but their true worth doesn’t come from being honored in sports. Their worth comes from something much more eternal. As a parent, that truth is what needs to be poured into their lives on a regular basis and when they know their value isn’t developed around some sports field than the true life trophies can begin. I am a proud mama too and cannot tell you how much the “last swim” meant to me and to them. Watching them warm up and swimming for the first time and then the final race was a real life trophy that has carried on into their future jobs and responsibilities. It wasn’t about the awards. Amen, amen and AMEN!!! I am so tired of seeing our kids receive a trophy for showing up. For Pete’s sake, who got them in the car, made sure the practice and game attire was ready, fed them early and made sure they got there on time? ( I am not asking for an award at all. I ‘m just saying that many times the kids like sports but not all the work it takes to get there prepared.) Last year, we played baseball and I was the team mom. I was thrilled when the coach said that we would not be doing trophies. Our “team party” involved going to get ice cream as a team after the last game. Isn’t the “trophy” having fun, loving sports and finding value in working as a team? I like seeing the kid who has never played a sport before learn to play and find his/her own love for the game, I like seeing the kid who struggles finally break through the wall and I really love seeing the other team mates cheer for each other when something good happens to their teammate and not themselves. OMG YES!!!!! I can not tell you how many COLLEGE STUDENTS don’t get it these days!!!! I have seen so many complaining about their grades because they “did their homework” WRONG and didn’t get an A for trying!!! Seriously, this attitude of a trophy for participation turns into an expectation of an A for little to no effort and then it carries into their adult life if left unchecked! They expect to be rewarded for sloppy “work” just because they did attempt to do it. So many teens & young adults are having an awful time adjusting to real life because of this mentality. These are the same kids that are never satisfied with anything, take care of nothing and have no idea how to actually work towards a goal and accomplish it. I can’t imagine what that feels like for them. What a slap in the face adult life must be for them. One of the very best skills we can teach our children is how to handle disappointments and failures in a healthy way. Everyone experiences the lows and those lows are what make you appreciate the highs! Plus, if we teach them they’re great at everything that they’re not, they may never find the thing(s) they truly do excel at. I told my kids that I would not work harder for their sports/music or whatever they were into than they did. Telling me at 6 am that they needed their uniform washed by 4 meant they would have to pay to have it laundered at the cleaners or wear it dirty because I had my own job to get to. Amazing how making them be responsible for their own stuff throughout their childhood made them responsible adults! It also made them appreciate when I was able to help them out rather than just expecting me to fix their mess for them. So what if I wasn’t the coolest mom or the “best” mom when they compared me to their friends’ mothers. I never had an issue with not winning the mother of the year awards as long as my kids were staying on course to becoming responsible, self-sufficient adults. You have said it much more eloquently than I would. And trust me, that is a GOOD thing. This is a hot button with me. Thanks! I totally agree and couldn’t have said it better myself. In the real world, as adults, we don’t get rewarded for being mediocre. Children might as well learn that at a young age. I’ve been preaching this for 20 years! I don’t think it’s going away – it’s pereating every part of their lives! My kids are all college grads, with great jobs whose bosses LOVE their work ethic! Surprise, most young adults are not like this. period. I never participated in extra-curricular sports, but I do remember elementary school Sports Day (in the 70’s and early 80’s) and how ribbons were awarded for 1st, 2nd and 3rd place. There were always 4 houses and if your house came in last you came in last. No ‘I showed up’ ribbons, no nothing. I never felt cheated, it was what it was. Studies are showing up now that say kids like me, who were essentially thrown outside Saturday morning after cartoons and called home Saturday night when the street lights came on, do better in life because we learned lessons, experienced things, had to think things through. I’m with you on saving league budget money by not buying the trophies and I could really do without a trophy that will end up at the bottom of a toy box, but I’m sorry I have to respectfully disagree on the trophy causing entitled kids. I have two daughters (10 & 7) who swim competitively and my oldest tried soccer for two years. Here’s why I don’t have a problem. From my experience these trophies or ribbons are handed out in the early years. When kids are still trying to figure out if they like a particular sport. These years need to be FUN and built on teaching fundamentals of the sport. And yes, part of fun is getting a trophy. After these early years, youth sports gets extremely competitive (you know better than anyone) and the only kids to move on to travel teams, high school teams and college are the kids who have the characteristics that you spoke of: hustle, integrity, hard work commitment. The kids who don’t work hard and hustle at their chosen sport will not move on to playing at a higher level, because youth athletics is too competitive for that nonsense. This argument is putting the blame on the trophy and taking it off the parents and we’re the ones who truly teach our children about character.